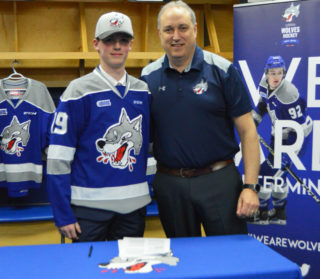 (SUDBURY, ON) The Sudbury Wolves are pleased to confirm that the annual Wolves Hockey Orientation Camp will be held at the Sudbury Arena for the first time this weekend. With ice sessions scheduled April 14th at 7:00pm and 15th at 11:30am, Wolves fans will have their first chance to see first overall selection Quinton Byfield, and we expect him to be joined by all 2018 drafts including tonight’s three U-18 draft picks. Fans will be pleased to know that they will receive Free Popcorn for the weekend at both sessions as well as select concessions stands will be open with special features. Prior to the on-ice scrimmage Sunday, this being the first time the organization has come together on the ice, the Wolves will feature a short tribute and moment of reflection to the tragedy that occurred last week in Humboldt before the ice session. While this is the first time many new Wolves will see the city, visit the Elgin street Barn and share in our rich hockey history, the organization looks forward to seeing many fans out to see the new recruits. In addition to the young talent, young returning stars, Blake Murray, Liam Ross and Anthony Tabak will be participating with the young recruits. Tonight’s 2nd annual U18 draft will get underway at 7:00pm. Fans can follow the OHL Draft live on our website above as well as through on Facebook, Twitter (@Sudbury_Wolves) and Instagram (SudburyWolvesOHL).